Save money on your car – lease it, share it and sell it! We’ve previously posted about how to save money c while driving, but what about the car itself: it costs a bomb to buy, a shedload to service and a fortune to fuel. How can it make you money? Can you make money from owning a car, to reduce costs? Or, if you’re feeling brave, can you do without it altogether and save your money but still drive when you need to? With the rise of new “collaborative” websites you’ve now got a chance to travel by car, save some money and do your bit for the environment. Try and work out how long your car remains parked each day. 20 hours? 22 hours? All day? You spend your money on something that just sits there doing nothing. That’s where Whipcar comes in – a really simple idea. They say that they pair “sensible drivers with spare car time”. In other words you submit details to their website about your car and people can hire it out by the hour, day or week (earning you around £20-30 a day depending on the car). Whipcar deals with the insurance and the only thing you’d need to get over is the nervousness that someone else is driving your car, although you do meet the hirer to hand over the keys and give them the once-over. And it’s something that people are interesting in doing in an effort to save money or boost their income. An ING eZonomics poll in February found that 25% of respondents would be happy to hire out their car if they weren’t using it on a weekend. If you travel a busy route each day would you like some company, especially one that pays their way as well? Car sharing has been around for years, usually through informal means through the office or neighbourhood grapevine, but with the web, car sharing has been transformed. There’s goCarShare, MyLifts, National CarShare and liftshare among others, all set up to pair drivers with passengers so both save money (and hopefully have a nice chat along the way). If you think that these websites are a bit impersonal then there are a number of regional car share schemes as well (have a search on Google for “car share” and your location). Examples include carsharedevon, CarShareNorfolk and the not-for-profit Hour Car based in rural West Yorkshire. So if you’re only using the car for one hour a day or less, why do you hold on to it? Could you live without it? It would mean there would be less traffic on the road meaning less harm to the environment. It would also mean, perhaps more importantly, less parking costs, no insurance hassles (especially for young drivers) and no worries over the rising cost of fuel or the car failing its next MOT. It’s a radical move to save money but you could sell the car and when you need more than just public transport you hire a car by the hour or by the day. If that appeals then with the rise of the internet there are quite a few companies that use the web to make hiring and sharing cars much more accessible, without the hassle of going to a car hire firm and filling in forms. There are two main types of “new age” car hire – pay as you go, and car clubs – however there’s little difference between the two. Both are based around hiring a car for an hour or a day, dropping it back and leaving it for someone else to worry about. 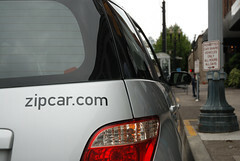 City Car Club offer pay as you go cars in 16 cities across the UK for an annual membership fee and a cost of around £5-8 per hour or £40-70 a day. You have to pay 22p per mile in fuel (although surely paying based on fuel and how efficient you drive would be better for the environment?). They predict that once you try car clubs “you’ll never want to go back to the world of private car ownership”. If you’ve sold your car then what are you going to do with your parking space? If you’ve got a spare space then the previously-mentioned Streetcar is after parking spaces in cities. Give them a parking space and you get a membership for free and driving credits (so you get the advantages of a car outside your house without the associated costs). Or if you feel that undervalues your piece of asphalt try and sell it on websites like YourParkingSpace, Parklet or ParkAtMyHouse. Money Saving Expert explains the advantages and disadvantages of renting your parking space here. With thanks to Collaborative Consumption (Update: Website no longer available) and the Carplus charity for the website ideas.